Okay… so since some of you have expressed a desire for more publishing stuff, I thought I’d give a little look behind the scenes, and share how a cover gets done at Night Shade. This isn't how other publishers do it... this is how Night Shade does it. We aren't any better, and probably are worse then others... but this is a rough process that has evolved organically over the last few years, and seems to play well to our strengths and weaknesses. Step one… talk with the author. 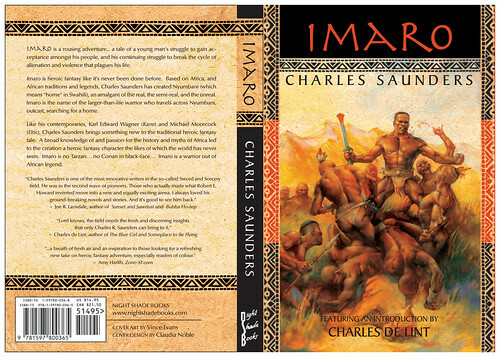 In this case, Charles Saunders, Author of Imaro. Each book is different and requires a different look at feel. 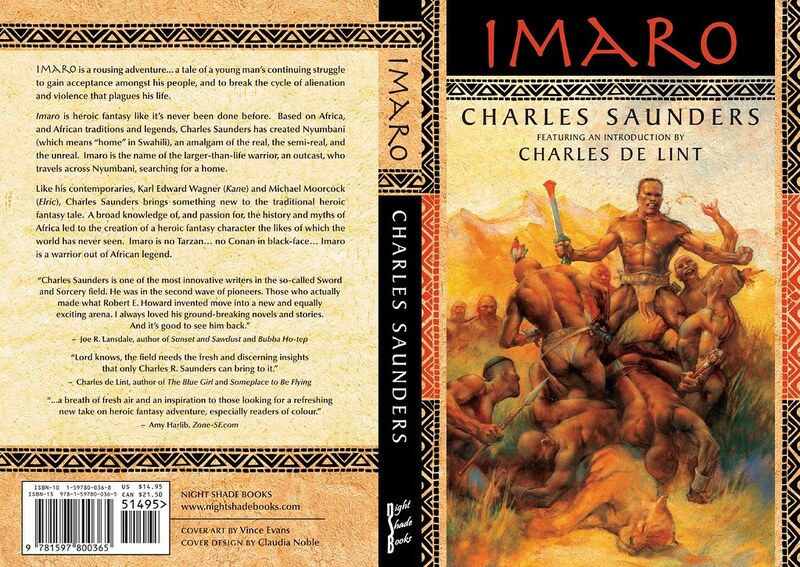 Imaro is a heroic fantasy novel, except its based on African legends and histories, instead of fetishized western European/medieval tropes. Of course, a cover is a way to signal to the types of readers who would enjoy this book that this is in fact a book they would enjoy. 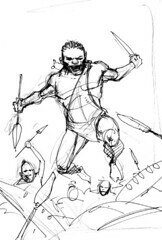 In this case, we want to signal to Heroic fantasy readers, but we want to reach beyond that, and reach out to a non-genre reading African American community. 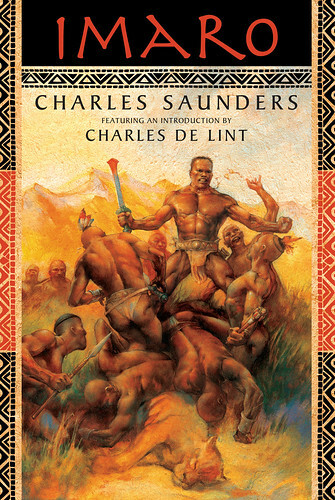 After reading the work and talking with Charles, it seemed to me that the novel can be seen as a metaphor for an African America fan of Science Fiction and Fantasy, who never really saw himself represented either as a character, or via writers. 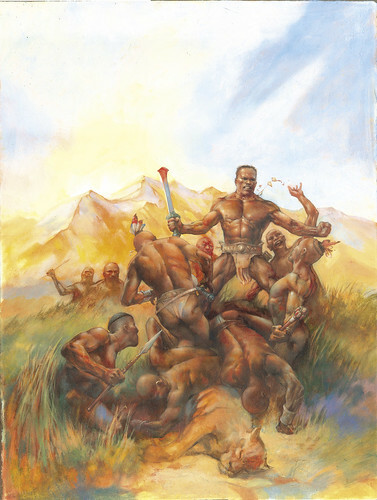 Themes of being an outsider in ones “tribe” dominate Imaro, and kind of shine through. This seemed to be a story that, despite its genre garb, would have a broader appeal, because it is a universal story, and in particular a the story of an ethnic minority. It IS the story of the African-American experience in America, just told in a different idiom. 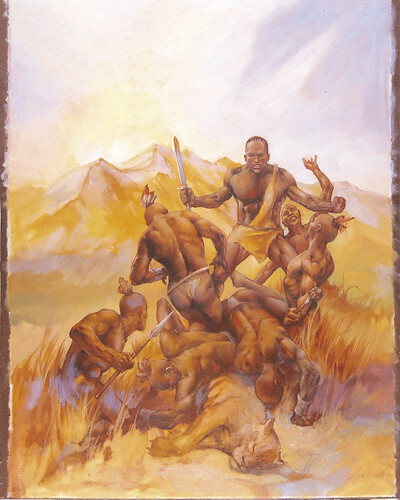 So we decided to combine a “tradition” piece of Heroic fantasy art, with a non-fantasy, ethnic/African design. Ideally this will the art will hook one group of readers, and the design, another. So after agreeing on this approach, I considered a number of artists, and finally settled on Vince Evans. Vince has worked on a number of really striking portrait style comic book character paintings that were featured in the Spectrum anthology that really caught my eye. I think at their core, superhero fiction, and heroic fantasy both share that larger then life kind of visual style. I contacted him, and Vince agreed to work on the book. So I sent him the manuscript, and some a few vague thoughts or ideas. After reading the book, he sent three sketches. We discussed the pros and cons of each, and went with one of them -- The first one. 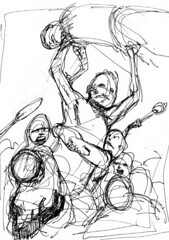 He then sent me a color rough of the sketch for approval. This looked to be the right direction so I told him to proceed. As the deadline approached, he came to me and asked for more time, saying he could meet the initial deadline, but it would be better if he had more time. So I gave him the deadline, because the first thing you need to do is build in flex time to your schedule. And the second thing you need to do is give the creative people as much time as possible to turn in their best work. 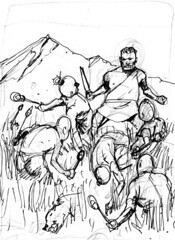 No use rushing, if it means your artist isn’t going to turn in his or her best work. I can always pick up the time on my end, by working quicker/harder/faster. He turned in an initial painting It was good. Not quite as spectacular as some of his work, but good. I began putting that piece through its paces… setting up an initial design template for our designer. I don’t know how its supposed to happen, but at Night Shade, I usually take the artwork and blurbs, descriptions, barcodes, etc, and any initial design ideas, and I lay them into a template that has the correct front panel/spine/back panel dimensions, sometimes with detailed design ideas, and sometimes with just a note about what kind of “style” I want, and I turn that file over to our designer, who works up an initial design for approval, and then finishes it off. Just as I was turning it over to our designer, Vince came back to me and asked for another extension and that he could turn in an even better version. I was happy to see Vince so committed to the project so I said “sure”, and spent the extra time coming up with some very specific design ideas. First I decided that some traditional African patterns should be incorporated as borders or decorative pieces, and that the back panel should not be a solid color but should be a texture… a clay/adobe wall type texture… to summon up the feel of a pre-colonial African village. 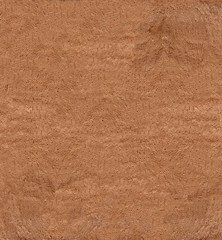 I searched around for some images of African pottery, in order to get some patterns and I spent a lot of time in Photoshop, creating a 6x9 300dip clay wall “texture”. Then just as I was beginning to package this all up, Vince came back with a the final piece of artwork, which was a lot better then the previous version. Cool! Thank you Vince! Always give your artists plenty of time to do their best work! I packaged this new artwork up with my design, and samples and texture and sent off to my designer. I had absolutely no idea what to do, font wise, and left that entirely up to the designer’s discretion. She came back with an initial design that rocked the house… It very deftly melded the painting, so it appeared to be painted on the textured wall… almost like a mural… and she did it with the “dead” or soft part of the painting – the sky, while leaving the detailed areas of the figures and actions pretty much undisturbed A very subtle and effective way to tie the painting into the clay background. She also washed out the background on the back so that the smaller text could be read, and she came up with a nice repeating design/pattern, with a great color combination, which she repeated elsewhere in the cover. My only concern with this was that a minor one --- Charles de Lint’s name on the cover was a bit hard to read, and it was covering up one of my favorite parts of the painting - the lion - which is an important part of the story. So I asked her for a revision, which she got to work on. 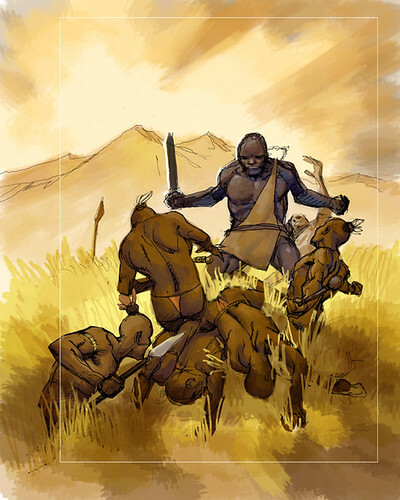 At the same time, I sent a copy of the cover over to our proof reader, and got any textual/punctuation errors fixed. He sent me the corrections which I forwarded to our designer, and had her incorporate those fixes into her new design, which tweaked the Charles de lint placement. She sent a final low-res pdf, which I Okayed, and then she uploaded a final Package… an Indesign file, with all the text and graphic elements compressed into one file, and a sample Hi-res PDF file. The application package will go off to the printer, and the PDF file is for me. This is how a concept becomes a book cover. It's a great cover because of the hard work put in by both the artist and the designer, both of whom delivered in spades, on this one. Extra special thanks to Vince for sticking with it, and turning in his best work, and to Claudia, who managed to visual combined to very disparate elements into a cohesive whole. I like the cover. It matches my initial concept in my head pretty close. Jason likes the cover. And the author likes the cover. This is pretty damn good, because that’s not always the case. And we are only about 3 weeks late on this one! Yay! Off to the printer with you!